blackfly on runner beans. Grr! FINALLY, some rain. Stop moaning, it had to happen, since I spent a morning in the drizzle at the allotment lugging watering cans about. It was virtually a rain-dance. The plot looks rather sorry for itself. 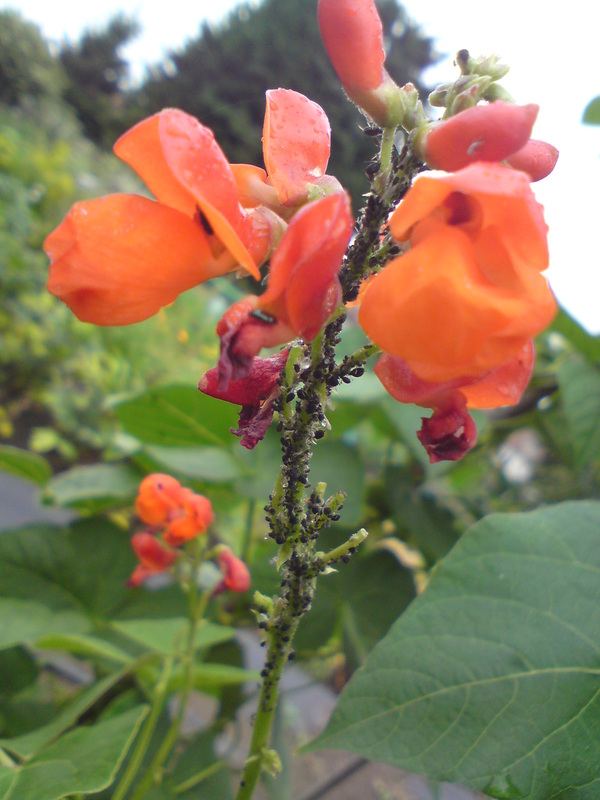 After a disappointing start with many plant simply dying off, I have managed to get a few runner bean plants into flower but they are covered in blackfly. If this is your first year growing runner beans, don’t despair and write yourself off. It’s not you. Runners are usually one of the easiest crops and they look lovely in the flower border too, climbing clematis and other plants whose flowers may have finished. They (usually) produce lots of beans with virtually no effort from you, other than a nice trench of muck or kitchen waste when you plant them out and plenty of water in dry weather. I’ve never had problems with beans before. I’m hoping it’s just been the dry weather. I don’t use insecticides and there are too many to rub off with finger tips. However, just as I was going to write off this year’s crop, I spotted a ladybird, then another. Closer inspection showed there were 14 ladybirds on one wigwam alone. Hurrah! Ladybirds love aphids of any kind. They scoff them and lay their larvae on them who scoff even more. I’m leaving it all in their capable jaws. If you spot a funny-looking bug on your plants that is black with front arms and yellow stripes on its sides, which looks absolutely nothing like a ladybird, DON’T kill it. This is what a baby ladybird looks like, and it will be your ally in the fight against aphids of all colours.